Frans Johan Louwrens IR (FJL) Ghijsels had not been there. But we can still trace the works of the architect. Ghijsels works were still standing on the ground the former Batavia. It may be that every day we are based there, or at least through the buildings from the early 20th century it was. In Kalibesar, Dutch-born child Tulung Agung, East Java, was incised by the Office of John Peet & Co. who is now a PT Toshiba and office buildings Maintz & Co. who now PT Samudera Indonesia. Powder Road, where the now closed tin fence and seemed to be left unused, you can have a peek inside the magnificent building. It is the former building Wehry & Co. Geo. Other buildings which may be more popular is Pelni Petamburan Hospital, Central Jakarta, which was once the Hospital KPM (Koninklijke Maatschappij Paketvaart). Another KPM Building at Jalan Medan Merdeka Selatan, now the Office of the Department of Sea Transportation, Meester Cornelis Catholic Church (St. Joseph Catholic Church in Matraman), and Paul's Protestant Church in Menteng. Ghijsels did not work alone. He joined in Algemeen Algemeen Ingenieur Ingenieur Architectenbureau or Architecten (AIA) - a public agency of civil and architecture founded in 1916. Three masters of this firm, other than Ghijsels, Ir Hein von Essen, and Ir F Stlitz. Prior to this firm stand, and Essen Ghijsels worked as a technical advisor to the government while the F Stlitz as an entrepreneur building. At the request of the bureau service users AIA, the firm is not only designed buildings, but also act as a contractor. With so many buildings are designed, there is a Art Deco style buildings are considered very important in the journey Indisch style architecture, so it is written in the book FJL Ghijsels: Architect in Indonesia. 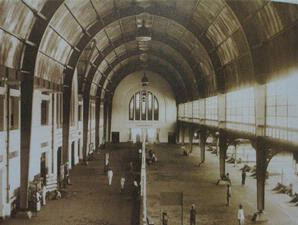 The building was none other than Station South Batavia (Batavia Noord) or what is known as Jakarta Kota Railway Station and is often called Beos Station. On October 8 last, exactly 80 years ago, this station was inaugurated. This station replaces the old station, Batavia Noord, which is no longer in operation since 1923. In 1926, along with AIA Ghijsels started designing the building. And right on October 8, 1929, a salvation held for the safety of the new station. Javabode Newspaper October 17, 1929 edition wrote, "South Batavia Station is a station that is very impressive and is the most beautiful stations in the east." In front of this station, first, broad lawns stretching once called Stationsplein. Now the existence of the field was very narrow and increasingly less as a final stop TransJakarta. Way around the field, until now, was named Road Field Station (Stationsplein). Architect in the book as well as Indonesia's answer to the question of age at the monument in the middle of the park and Beos Station some time ago got out of his position. The book is clearly mentioned, on the safety of October 8, 1929, train employees to bury the two heads of buffalo, which is one of Stationsplein between the hours and the main entrance, and one in back of the new building.